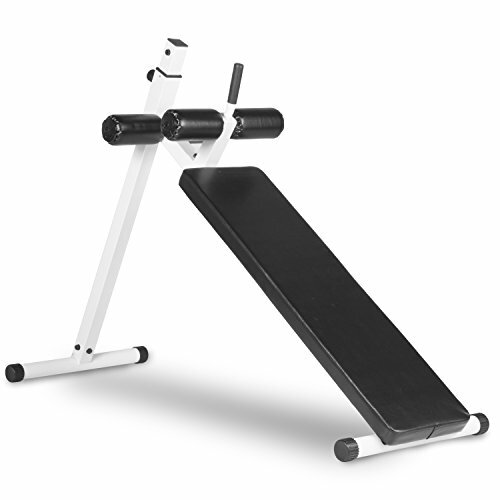 Challenge your ABS to a fat blasting, core targeting workout with the x-mark XM-4380-WHITE. The x-mark 10 position adjustable decline abdominal bench is a full size abdominal weight bench (45" tall) with 10 vertical height adjustments for beginner to advanced core workout. With a weight capacity of 350 lbs., this machine is built tough with sweat and tear resistant vinyl, 2" x 2" steel construction and a scratch resistant powder coat finish. Dual vinyl covered, ergonomically positioned knee and 3.5" roller pads and a 2" high density foam cushion provide comfort and support throughout your Ab workout. Get that elusive 6-pack you've been coveting with the x-mark XM-4380-WHITE. Assembled dimensions: 61" L x 21.25" W x 45" h.